The high growth in oil and natural gas prices led to seeking alternative sources of energy. Also in Slovakia, which predominantly uses gas, we started to look around for other options of obtaining energy. We focus on well-known and tested technology of electricity and heat generation, which is used in our country to a small extent. Biomass use for energy purposes came to the front. 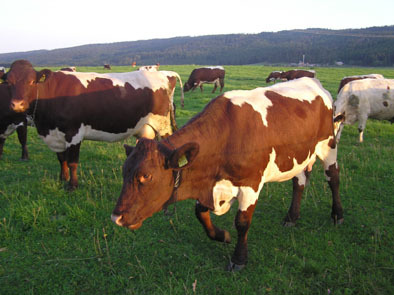 One such possibility is biogas production from agricultural waste – mainly from animal breeding and green plants. In this case, biogas is used as the source of combined heat and power generation. In principle, all organic substances can be at least partially decomposed in an anaerobic (digestion process by means of bacteria without air supply) or aerobic (digestion process with air supply) manner. Especially wet liquid materials, such as manure, food residues, grease, or silage, are excellent products for anaerobic treatment. An important factor for determining the method of decomposition is the dry matter content in the material. The content of dry matter of 5–15% is optimal for the biogas technology. The upper limit of 15% of organic dry matter is the maximum permissible value at which the raw material can be used and mixed. As for composting, the upper limit is 40–60% of the dry matter. The entire process of biogas production in an anaerobic manner takes place in fermentation vessels in biogas plants which are often built within agricultural plants or in their vicinity. Biogas stations usually consist of several basic objects. The first one is the preparatory tank for the input raw material – manure, waste, silage, etc. From this tank, the material is regularly dosed to the main part of the biogas plant – the fermenter – where the process of digestion and biogas production takes place. The fermenter can be horizontal or vertical. The horizontal design allows achieving a very positive effect of piston flow where fresh material is pushed from one side, and digested substrate comes out on the other side. This prevents the unnecessary mixing of the fresh input material with the already digested and used substrate. Moreover, the shape of a horizontal cylinder allows the installation of effective mixers that can stir the raw material in a direction transverse to its flow. The disadvantage of this type of tank is its size resulting in heat losses (over-size tank surface in proportion to its volume), the needed space, and ultimately, its price. The advantage of the vertical design, when compared to the horizontal one, is that it is possible to achieve a better balance between surface and volume, thereby reducing material costs and heat losses. The tanks are generally made of concrete or sheet metal and can be placed above ground or underground. The disadvantage of this type is the impossibility to ensure piston flow of the material. Cogeneration is a process where biogas is used as fuel for the combustion engine which drives the electricity generator. Waste heat from the cooling of the engine and combustion products (exhaust gases) can be used for heating. Cogeneration units serve for this purpose. Simultaneous electricity and heat generation is the main benefit of cogeneration, as it ensures higher effectiveness of biogas utilisation. Electricity is used for the purposes of the biogas station as such or of the agricultural plant, or is sold to the public distribution network. The generated heat is partly (approx. 25%) used for the heating of fermenters. The rest can be used for the heating of buildings, greenhouses, workshops, livestock buildings, etc. 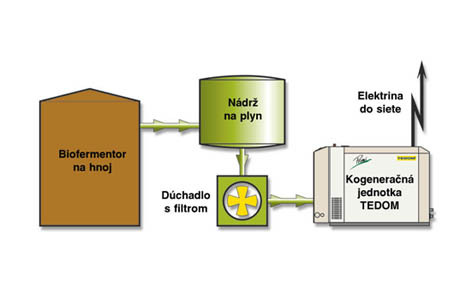 A demonstration biomass facility was constructed at the University Agricultural Plant of the Slovak University of Agriculture in Kolíňany pri Nitre. Its operation was launched in 2000. This facility uses excrements from 80 large livestock units for the purposes of biogas production and subsequently for the cogeneration of electricity (22 kWel) and heat energy (45 kWt).